There are 6 comments for this item. The original barrel was simply a can. We played with this....but got bored pretty fast ! I got one of these as a birthday present. LOL. Well, you play the game - trying to get all the monkeys out of the barrel (or in the barrel?) one at a time, hooking their hands together. And then, as a young kid, I LOVED monkeys - so just playing with them, and feeling like I had a whole barrel full seemed sort of "neat" - I must have been kind of a weird kid! What would you actually DO with them? 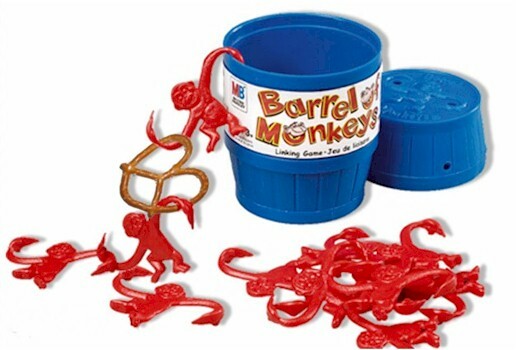 I LOVED my barrel of monkeys!